NOTE: This story has been updated (see below). Merle Haggard was forced to cancel his show Tuesday night (2-2) at the Fox Performing Arts Center in Riverside, California last minute after he was too sick to take the stage. The show was a makeup date for a performance originally scheduled for December 3rd that Merle was forced to cancel with all of his December shows due to a double pneumonia. Merle also canceled shows on January 30th and 31st in New Mexico as he continued his recovery from his recent health concerns. “Thank you to the fans who came out tonight in riverside! Sadly I’m just not strong enough yet,” Merle said on social media. He also posted a photo of a fan praying behind his bus after the canceled show. According to concert goers, Merle’s son and guitar player Ben Haggard came out on stage and played an opener, and then Merle’s fiddle player announced that Merle was too sick to take the stage. 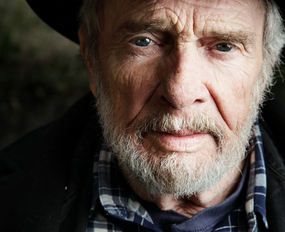 Merle Haggard spent 11 days in the Eisenhower Medical Center, plus additional time in a recovery facility after being diagnosed with the double pneumonia in December. According to Merle, he nearly died from the illness. Merle credits Gene Autry’s widow Jackie for getting him to check himself into the hospital where the double pneumonia was diagnosed. He also says he lost a lot of weight due to the illness, and will appear differently on stage. Merle has another show scheduled at the Saban Theatre in Beverley Hills with Kris Kristofferson for Wednesday (2-3), and another show on February 6th in Las Vegas. This is a time where Merle needs to forget about his shows and take the time to get healthy. We as his fans would understand that. I have never seen Merle live but I had tix to both cancelled Riverside shows. Thoughts and prayers to the Hag. Hope he takes it easy, the true fans would understand. Saw a picture today on Facebook of a man knelt down behind Merle’s tour bus last night, praying for him. Pretty cool. He does need to stop, take a break and get healthy. The flu season is kicking up into high gear everywhere. He can’t take that chance that anyone around him would give it to him. Stay home, Merle. We’re praying for you. Yep. Apparently he is getting a hip replacement. Had tickets to go see him here in Arkansas in March and got an email yesterday announcing the cancellation. The sad irony is that I had convinced my best friend and his girlfriend to go with me and mine because he’s a huge Don Williams fan and has never seen him. The hook I used was “he won’t be around forever.” Kinda wish I’d have kept my mouth shut. Too be fair, I kinda did the same thing with Garth when I saw him at The Sprint Center in Kansas City during my senior year.